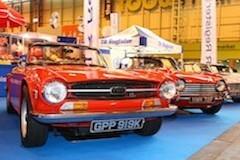 There's a mouth-watering array of classic cars on display at the Lancaster Insurance Classic Motor Show. Whether you've a passion for traditional British classics, vintage motors, historic motorsport, European exotica, American muscle, or prefer the more modern retro classics, you won't be disappointed. Take a nostalgic trip down memory lane and enjoy the cars from years gone by.